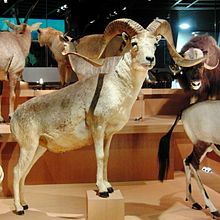 The argali or mountain sheep (Ovis ammon) is a wild sheep. It lives in the highlands of Central Asia (Himalaya, Tibet, Altay). It is the biggest wild sheep. It stands as high as 120 cm. It weights as much as 140 kg. The Pamir argali (also called Marco Polo sheep, for they were first described by that traveller) may be more than 6 feet in length. It is globally endangered. This page was last changed on 4 December 2013, at 16:15.